Intentions, not resolutions… that’s what it’s come down to. Resolutions often focus on the negative, on resolving to fix something wrong, to quit something. Often these resolutions are broken in under a week. Sigh… more negativity. But an intention is positive. I will… I can! Each year the blogosphere is buzzing with choosing a word for the year. It’s meant to express an intention for the upcoming year and become a mantra to help each of us stay the course. In 2012 my word wasn’t a word, it was a phrase. I just couldn’t seem to distill it down to one – single – word. It propelled me to participate in the International Fake Journal Month and led me to sign up for book binding classes among other things. It served me well. 2013 arrived and my word screamed to me! Out with the old and in with the new. It’s been a year of change and decluttering, so much that I actually feel lighter. My quilting UFOs were weighing me down and all the fabric I was never going to use, a bookcase full, found new homes with my fellow quilt guild members. The decluttering went deep and beyond my studio and extended to divesting myself of family items I thought I’d carry around forever. Now, a photo, a sketch and the memories of good times are enough. So 2014 arrived and my word came to me immediately! This blog is a stretch. Yes, I’ll upload my artwork but writing about it and sharing a bit of myself? Oh yeah, it’s a stretch alright. Baby steps. This is a year of possibilities for all of us. If having a word intrigues you but you need ideas then please take a look at the words Jane LaFazio accumulated. Maybe one of those words will speak to you. 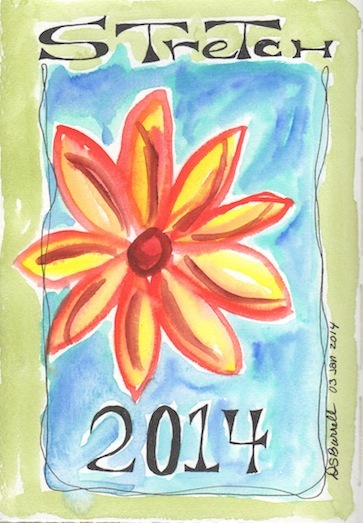 This entry was posted in Inspiration and tagged Inspiration, Stretch, Word for the Year by Dana Burrell. Bookmark the permalink.